Lion Kathy and I arrived at the Ford Airport in Iron Mountain, Michigan on a beautiful spring day. 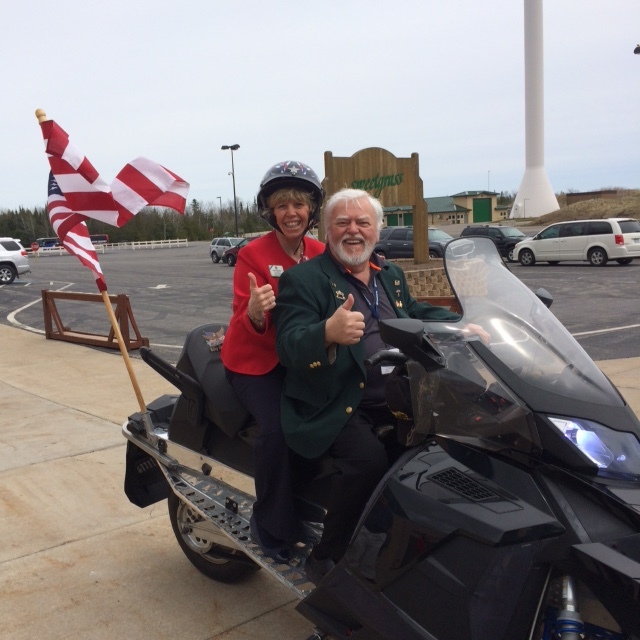 We arrived in Iron Mountain, MI and Davida Mooers, President of the host Heart of the North Lions Club, welcomed us with open arms. The short drive to the hotel gave us a view of the emerging spring season against a gorgeous blue sky. 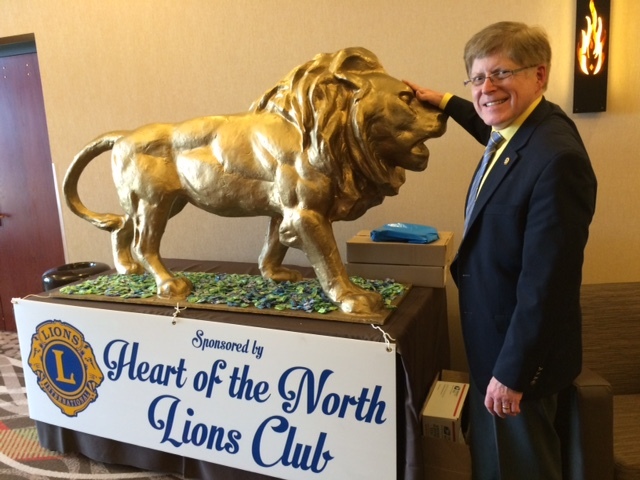 The Heart of the North Lions Club was the convention host club and their members were actively involved in making sure the convention was a great success! We made it in time for a short visit with the cabinet where we learned about a significant project being proposed by Lion Bill Bradfield as Centennial Legacy Project. 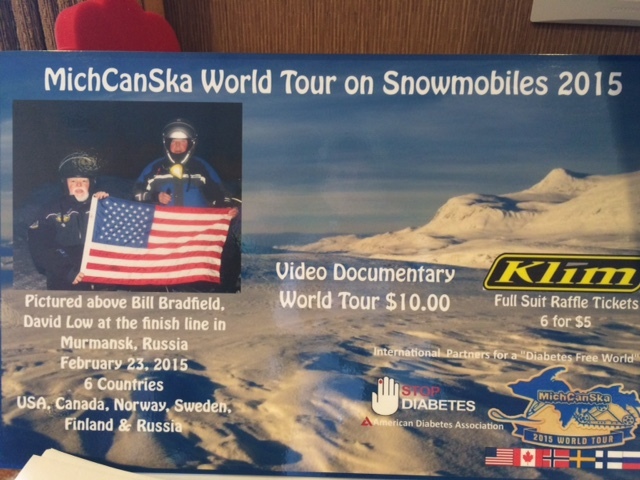 The project is entitled, “Riding for a Cure for Diabetes” and will involve a two-phase adventure. 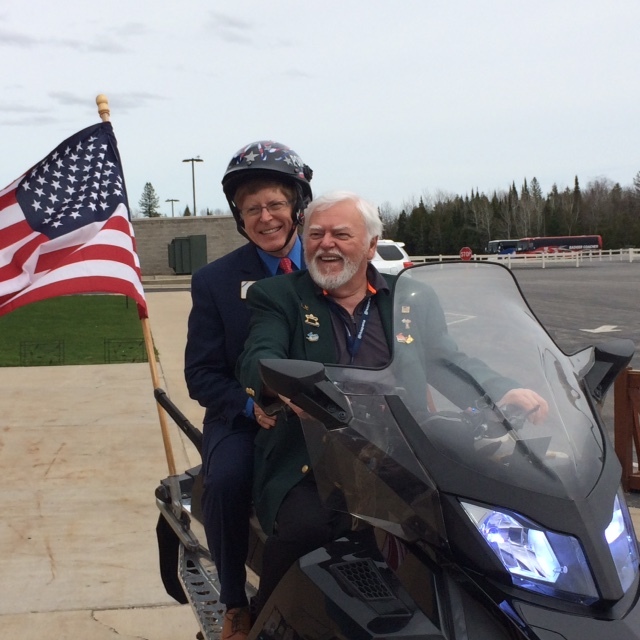 First, a motorcycle ride is scheduled in late July 2016 traveling from Cadillac, Michigan to Sault Ste. Marie. The second ride will start in late January leaving from Sault Ste. Marie riding for 6-8 days on snowmobiles through the states of Maine, New Hampshire, Vermont, New York, Ontario, and back to Michigan for the remainder of the 15 day event. In the last seven years, Lion Bill has organized eight extreme rides raising an incredible $243,000 for Diabetes Research and Awareness Promotion while partnering with the American Diabetes Association. ID Robert couldn’t miss the chance to ride with Lion Bill on his snomocycle! Lion Kathy and Lion Bill Bradfield on his snomocycle! 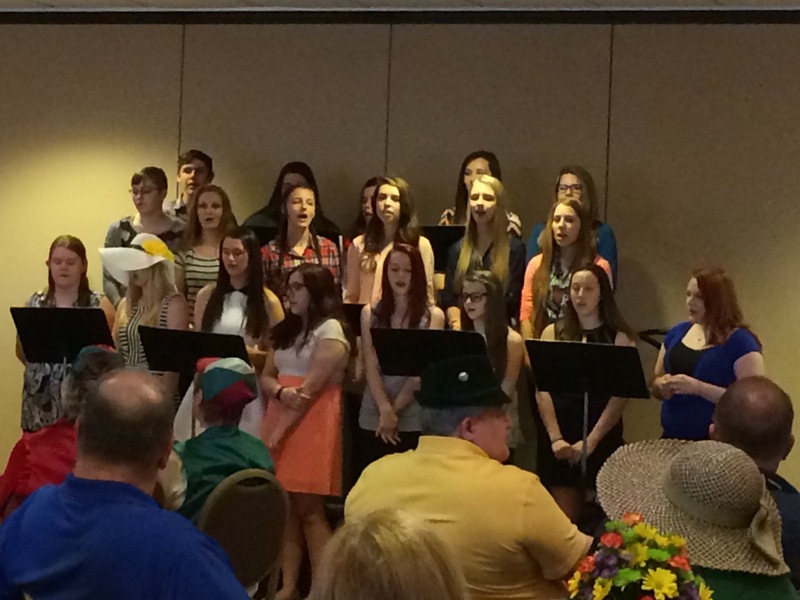 The Meet and Mix Dinner on Friday evening was fun-filled and the local high school chorus from Bark River-Harris School performed a range of pop music with enthusiasm. In the morning, the District meeting provided Lion Kathy and me with the opportunity to learn about the generous Lions of Single District 10. Later, at the Awards Luncheon, senior Leos from the Bark River-Harris Leo Club spoke about their experiences and passion for service. 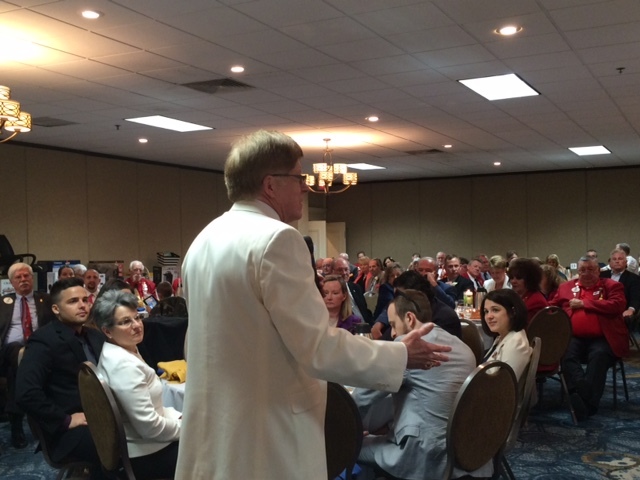 The Leo Club is very active and the members are the pride of the Bark River and Heart of the North Lions Clubs. 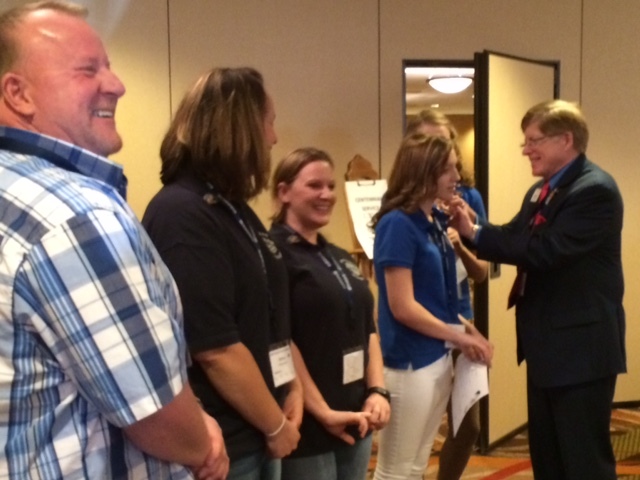 ID Robert gives the Leo Club members his personal pin while the advisors look on. 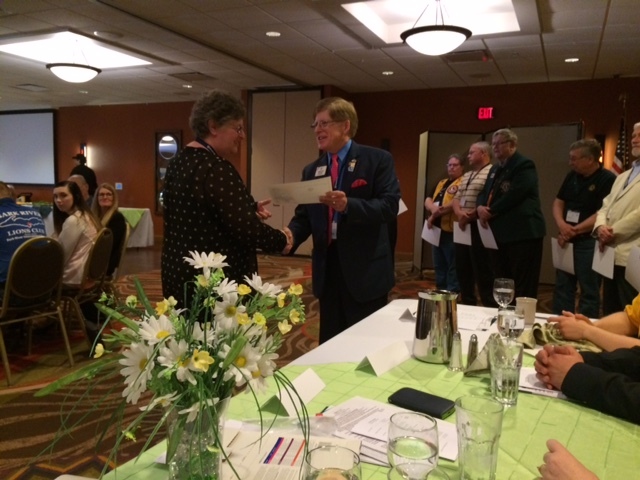 ID Robert assisted District Governor Tom Lanaville with his recognition awards for club secretaries. ID Robert reviews the peace poster entries. The displays were interesting and demonstrated the wide range of projects undertaken by the Lions of Single District 10. Later, the Governor’s Banquet was a special event that started with a parade of banners from all of the clubs represented at the convention. ID Robert and Lion Kathy wait to take a place at the head table. DG Tom Lanaville and ID Robert presented three Presidential Certificates of Appreciation to Immediate Past District Governor William Rowe (Gwinn Lions Club), Lion Peggy Lindeman (Gwin Lions Club), and Lion Rose Potvin (Heart of the North Lions Club). 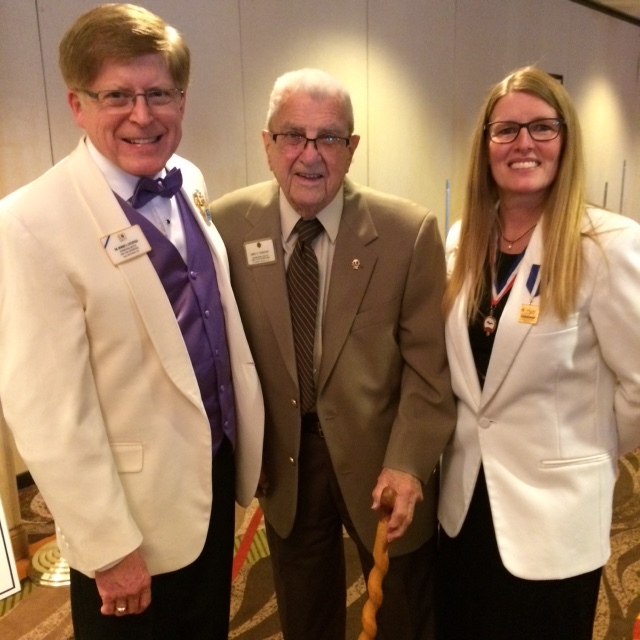 District Governor Tom, Lion Rose Potvin, and ID Robert. 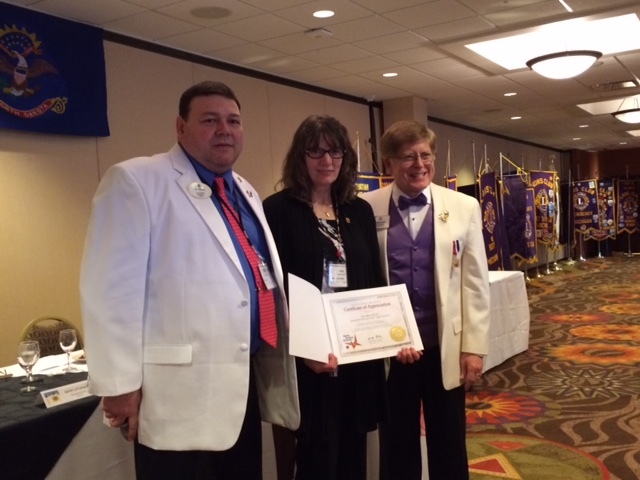 Lion Rose was head of the great 2016 host convention planning committee. One of the special moments of the convention for me came when Past International Director James Frendeway (1980-81) arrived at the banquet. 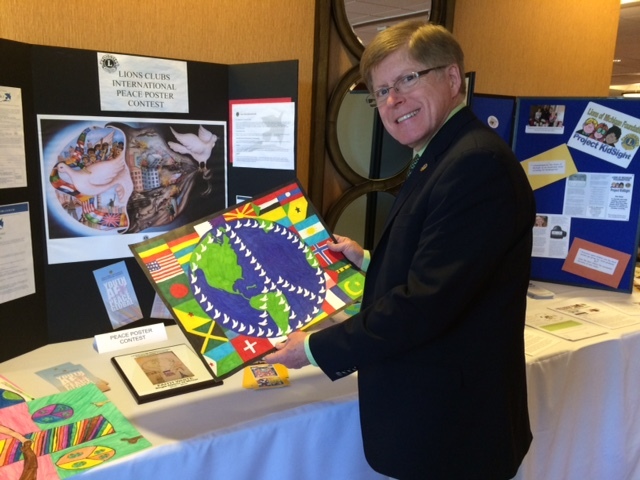 PID Frendeway is the last International Director from the Upper Peninsula to serve on the Board of Directors. PCC Jennifer Ware is a director candidate from the U.P. and while at the convention, the other candidate from Multiple District 11 (below the bridge) Paul Heinrich withdrew from the election and called for unanimous support for PCC Jenny to be put forward in 2016 at the International Convention in Fukuoka, Japan. ID Robert spoke of President Yamada’s theme: Dignity, Harmony, Humanity. The Necrology Service on Sunday morning started with bagpipes and Past District Governor Don Myers did a beautiful job paying tribute to each of the Lions being memorialized. Candles were lit and the bell tolled for each. ID Robert received a check from the Heart of the North Lions Club President Davida Mooers for the One Shot, One Life Measles Initiative. 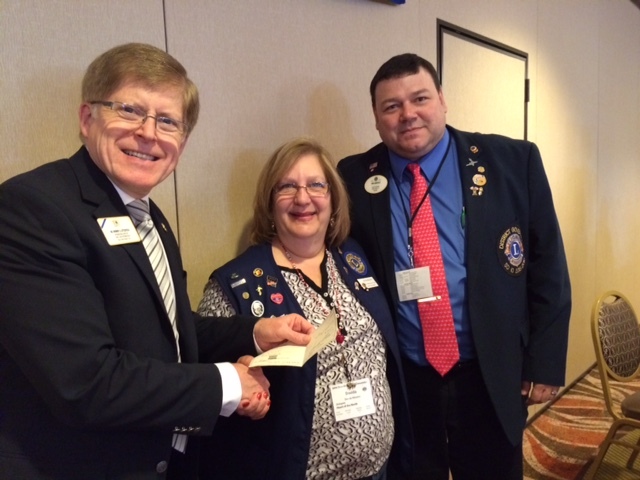 Overall, Lions from Single District 10 and guests donated $815 to LCIF. We appreciate every dollar raised for this worthy cause. 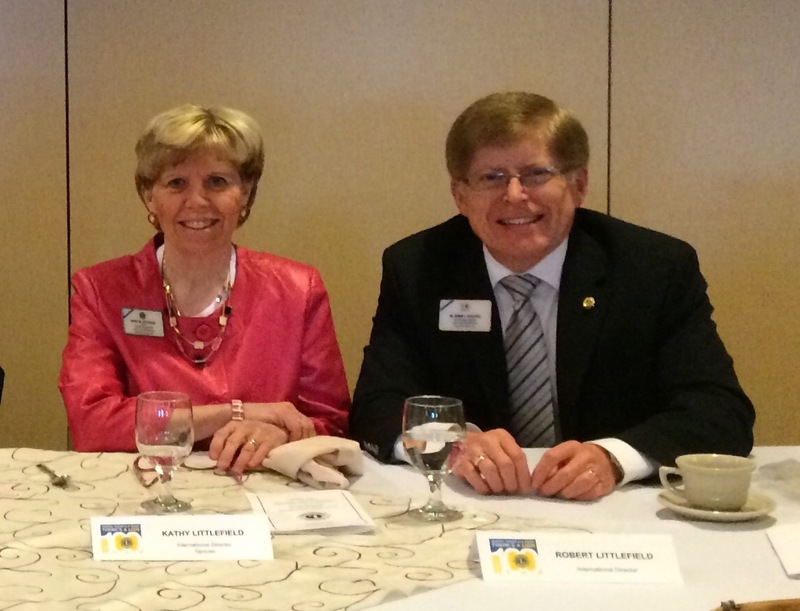 After the convention ended, DG Tom and Lion Davida took Lion Kathy and me to the U.P. 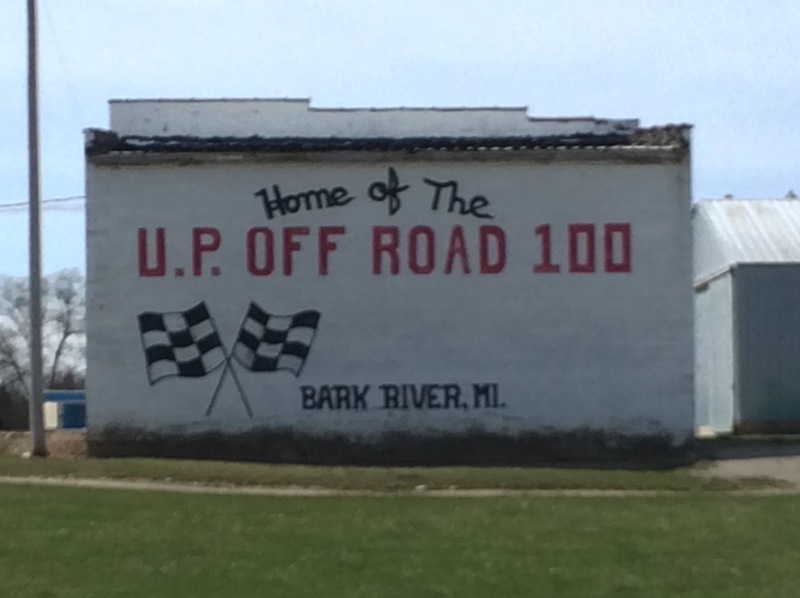 Off Road 100 Race Track sponsored and run by the Bark River Lions Club. This is a major project that began under the leadership of DG Tom’s father and it has expanded to an annual event of significant size. Every summer, thousands of people come to the racetrack and enjoy a top-notch event. 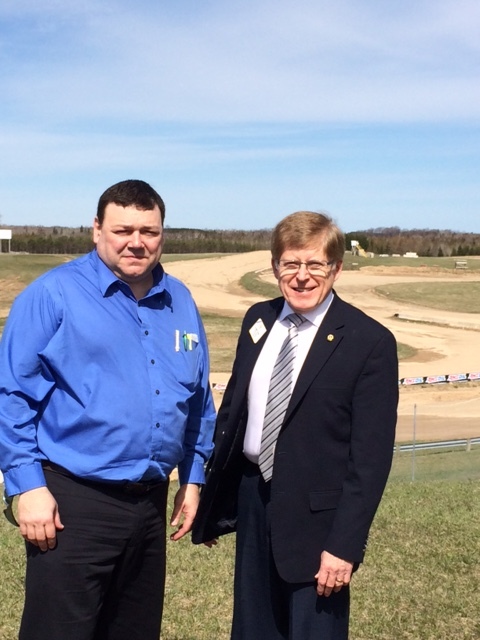 DG Tom and ID Robert with part of the racetrack in the background. 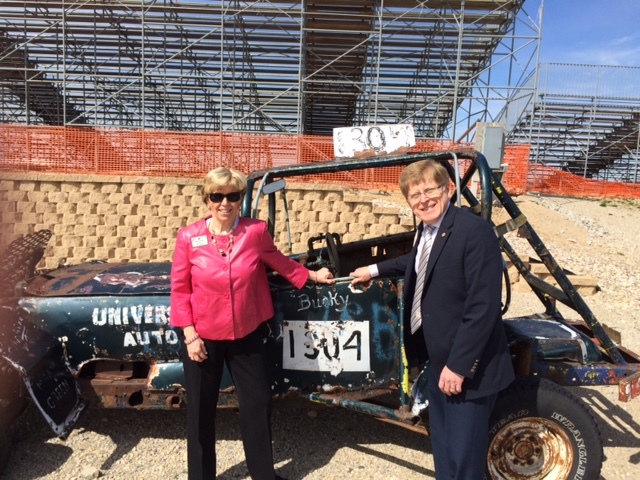 Lion Kathy and ID Robert pose in front of one of the original race cars at the facility. 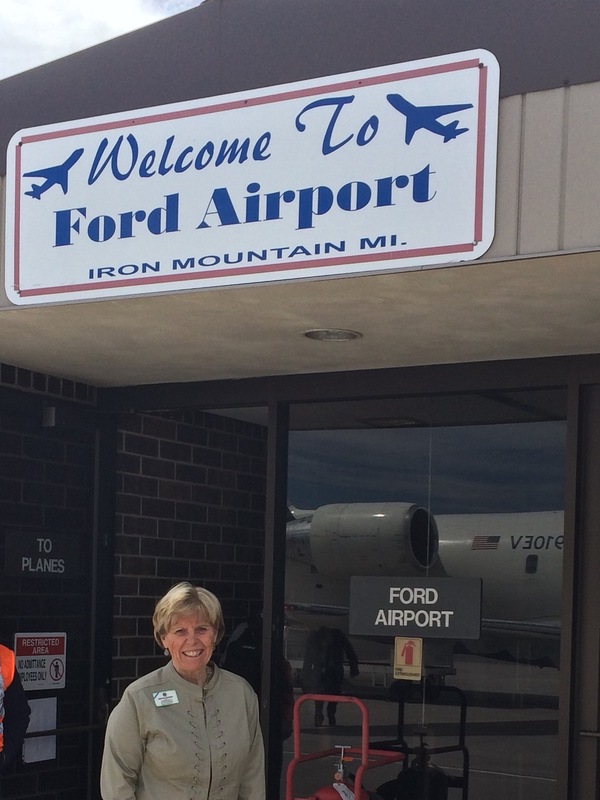 As Lion Davida returned us to the Iron Mountain airport, we thought of the beauty, generosity, and friendship shown to us by the Lions of the U.P. We congratulation District Governor Elect Matt Doney and his wife, Lion Laura who will be with us in Fukuoka in preparation for leading District 10 next year. Robert: Your ride on the motorcycle absolutely made my day! Ride on Lion Robert! !